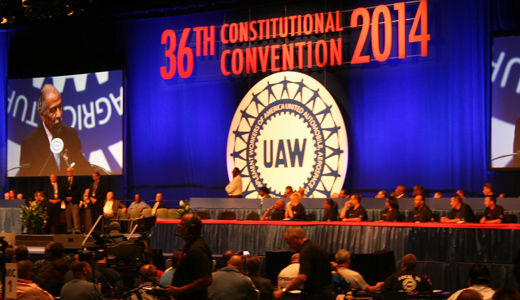 DETROIT – The United Auto Workers union is unfolding a fightback program at its 36th Constitutional Convention here this week. Like the rest of the union movement and workers worldwide, the union has been under assault from corporations and their political minions. In response, it is going on the offensive with a program called “PRO Members.” The “O” is for organizing. 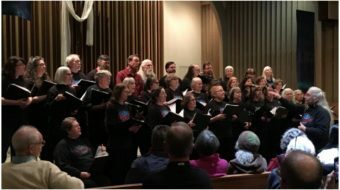 While far-right politicians engineered a highly-publicized defeat for the UAW at Volkswagen in Chattanooga, Tennessee, the union is nevertheless growing. UAW victories in the gaming industry and in factories related to the auto industry are steadily adding new members. The big nut the union has to crack remains the growing number of transnational auto plants in the South. But UAW leaders at the convention are positive about their future efforts. 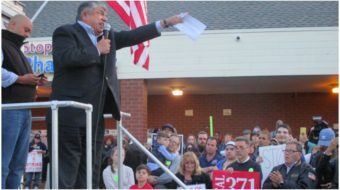 Long-time organizing efforts are still in place in Chattanooga and at the Nissan plant in Canton, Mississippi. UAW leaders have leveraged help from many international supporters who are represented at the convention. In its 2014 bargaining with major U.S. auto companies, the UAW will be faced with new “right-to-work” laws in a number of states, where the union’s legal right to collect dues from all workers in each bargaining unit will lapse. This includes the core of the union in Michigan. The new legal situation will require every union to conduct in-plant internal organizing drives that were never needed before. On the positive side, everything at the convention here suggests that the UAW is gearing up to the tasks before it.